(16/P9) TRENTON – The Department of Environmental Protection’s (DEP) Division of Fish and Wildlife today released a rehabilitated peregrine falcon near Spruce Run Reservoir in Hunterdon County, drawing attention to the continuing climb in populations of birds of prey in New Jersey. The male falcon released from the Division of Fish and Wildlife’s Clinton Wildlife Management Area sustained a severely broken wing in November. Its prospects back then appeared grim. By the 1960s and early 1970s, bald eagles, peregrine falcons and osprey had nearly been extirpated in New Jersey due to the widespread application of pesticides that caused eggshell thinning and egg failure. 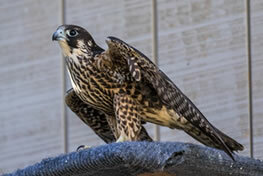 Peregrine falcons are experiencing record productivity rates. Thirty-two pairs now occupy appropriate nesting habitat in New Jersey, according to a 2015 survey conducted by the Endangered and Nongame Species Program. Of these, 28 pairs actively nested. Though still small, the population has stabilized and exhibits excellent productivity rates. Last year, the active pairs produced 63 young, or an average of 2.25 young per pair. Peregrines can be found nesting on bridges, water towers, and tall buildings. Some peregrine falcons relocated from New Jersey have even been used to help rebuild populations in West Virginia’s Appalachian Mountains. Peregrines relocated from New Jersey between 2006 and 2011 have been confirmed inhabiting the mountain areas of West Virginia and western Maryland. New Jersey’s osprey population, meanwhile, continues to show signs of firm recovery from steep declines in the 1950s and 1960s due to habitat loss and pesticide contamination. The Division of Fish and Wildlife estimates that there are now more than 600 osprey nests across the state. These specialized predators are found predominantly in coastal areas, with heaviest populations found around Barnegat Bay, Great Bay, Cumberland County’s Maurice River marshes, the Avalon-Stone Harbor area, bays around the Wildwoods, and Raritan Bay. Bald eagle populations, meanwhile, continue to soar to new record highs each year, with 150 territorial pairs counted in 2015. These nests produced 200 offspring – 199 to their natural parents and a chick recovered from a fallen nest in Maryland and fostered into a nest in Fairfield Township, Cumberland County, where it fledged successfully. 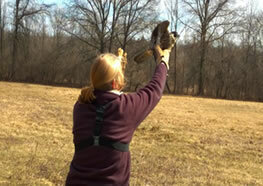 The male falcon released today was found Nov. 1 of last year in the yard of a Roxbury Township resident. It’s not clear how the bird was injured, but peregrine falcons make steep high-speed dives – upwards of 200 miles per hour – to capture prey. This falcon may have hit an electrical power wire or other high object during a dive. It was rehabilitated by the Millington-based Raptor Trust, a key nonprofit partner in the state’s work to protect and enhance populations of birds of prey. The DEP also issued a Certificate of Appreciation to Joseph Bourlier, the Roxbury resident who reported the injured falcon, enabling it to be taken to the Raptor Trust. Wildlife check-off funds go to support wildlife conservation programs in New Jersey. Details are included in the Form 1040 instructions.